Who loves the Target One Spot? All of you, correct? Thought so. They recently upped their adorable-things-for-a-dollar game and offered a whole section of crafty components - even tiny bottles of mod podge. I mean, do you have direct access to my brain or something, Target? 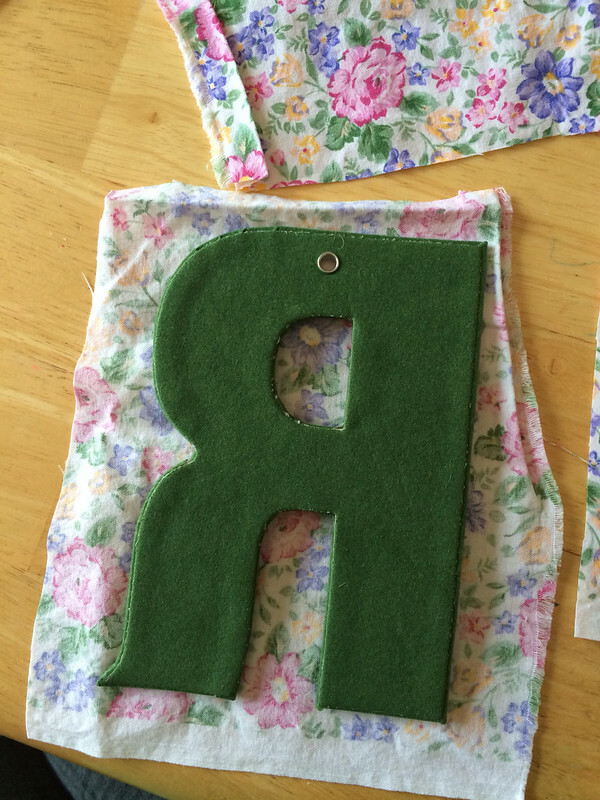 They had two kinds of monogram ornaments - the others were covered in burlap. 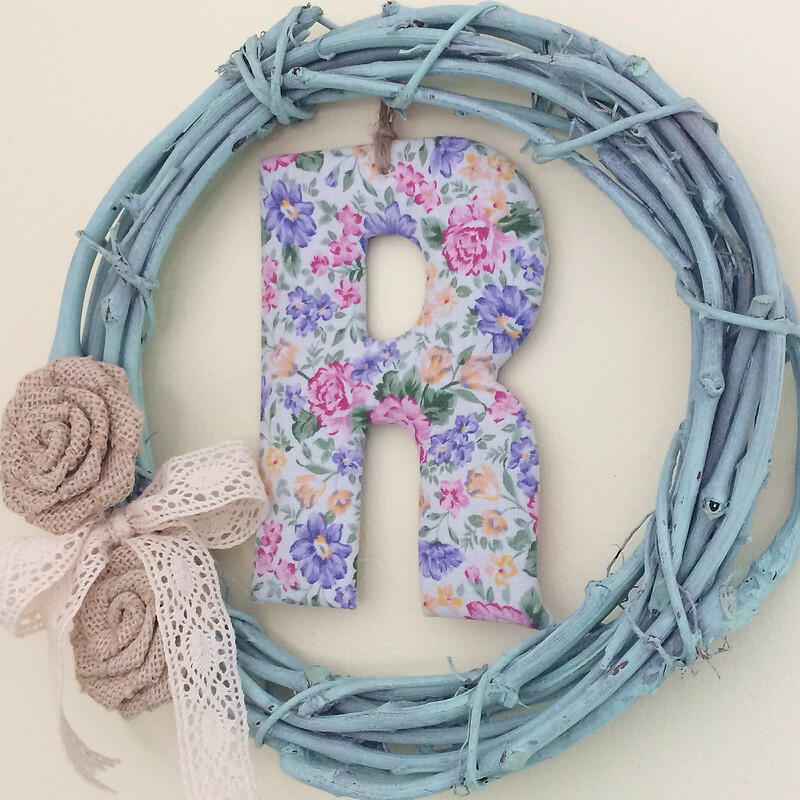 I looked and looked for a burlap R, but they were all out. I really didn't love the green - it would be cute in other color schemes, or as a more natural colored project, but it was too deep of a color for my kitchen. I realized that it would probably be crazy easy to cover it in whatever fabric I wanted (and I have so many random pretty remnants collected, I didn't even have to buy anything else), so I decided to go for it. So, step one was to decorate the wreath. It was crazy simple! 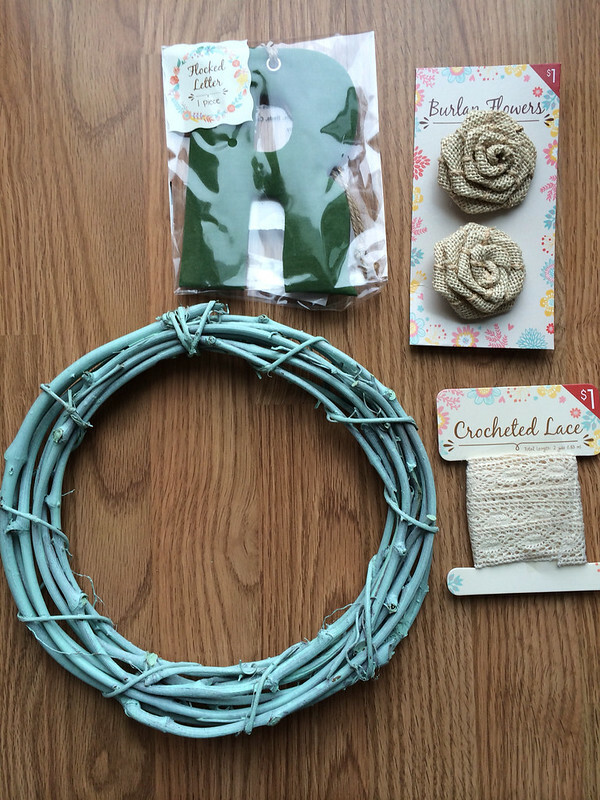 The rosettes came with little clothes pins attached to the back, so they just clipped right onto the wreath. Next, I just tied a little bow with the lace ribbon, and done! Next up was choosing the fabric. 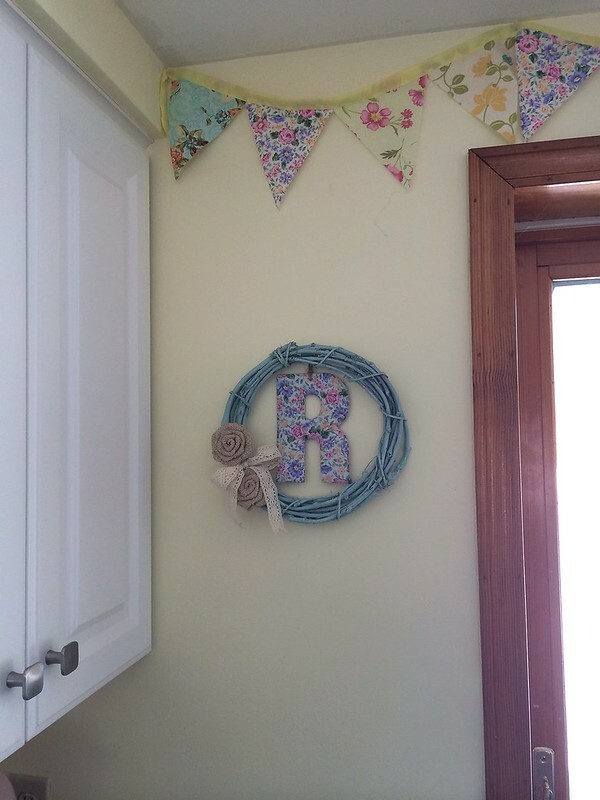 I have a couple homemade garlands hung in my kitchen using floral fabrics - I've used the same fabrics in SO many matching projects, and I still have more scraps left! I decided to use one of those floral fabrics to match the garland, and went with one that had a little pink in it to warm up the colors a little. 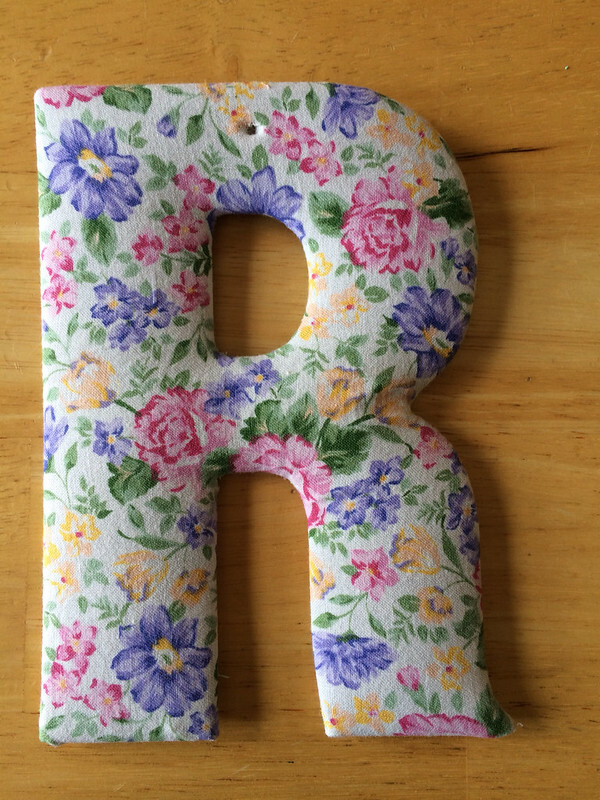 Covering the R was super simple! I gathered up my glue gun and shears, and got to work. First, I took the twine out of the opening at the top so it wouldn't get stuck under the fabric when I glued it down. 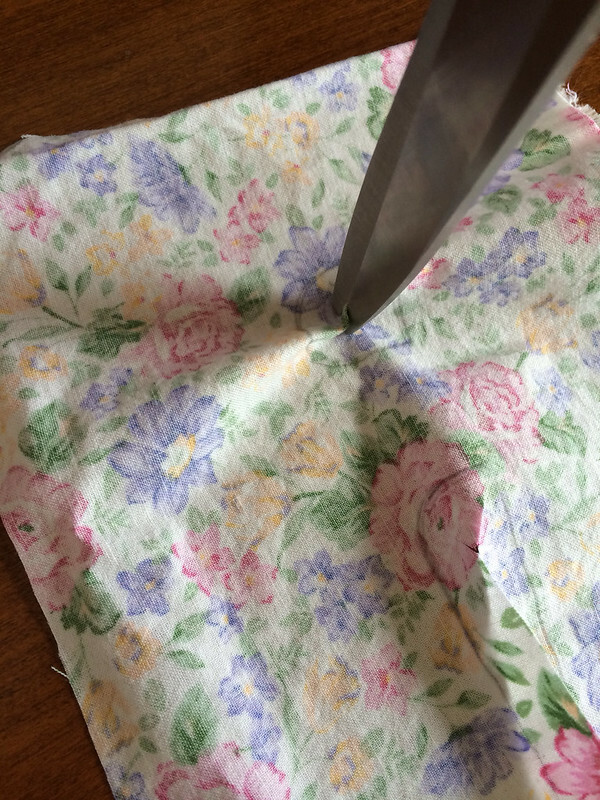 Then I cut a piece of fabric that fit, and turned everything upside down to mark the openings on the wrong side of the fabric with a pencil. 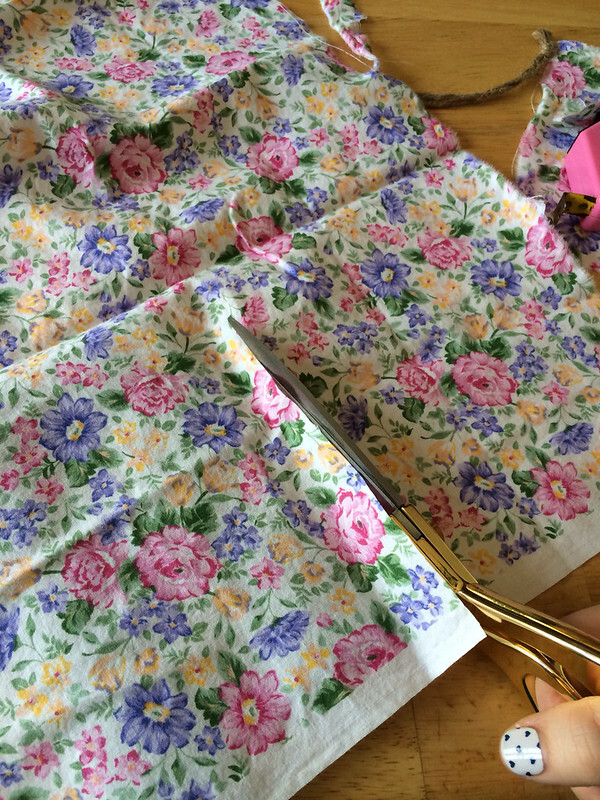 Then, using my shears, I cut slits in the fabric near each of the openings so the fabric would lay well. These don't have to be neat or any certain shape or length - even sloppy works here! 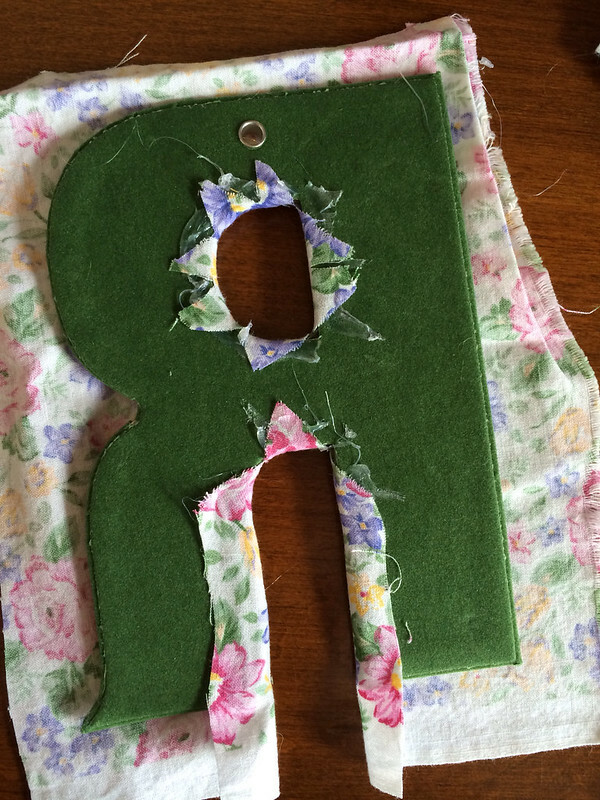 Starting in the center of the letter working outwards (so the fabric would lay flat and smooth), I began folding flaps of fabric towards the back of the letter and securing them with hot glue. If something needed more trimming, I just did so as I went along. This part got a little stringy and messy, but it was super simple to do. 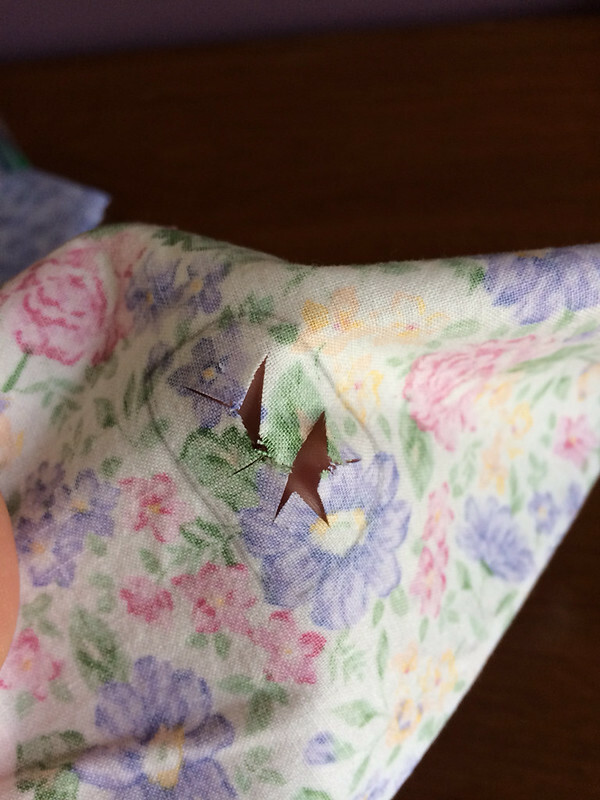 The most important part was pulling the fabric tight so it would look really neat and smooth on the front. When all the sides were glued down, I poked a hole through the fabric with my shears where the grommet is so I could feed the twine hanging back through the top. All that was left to do was hang it up! 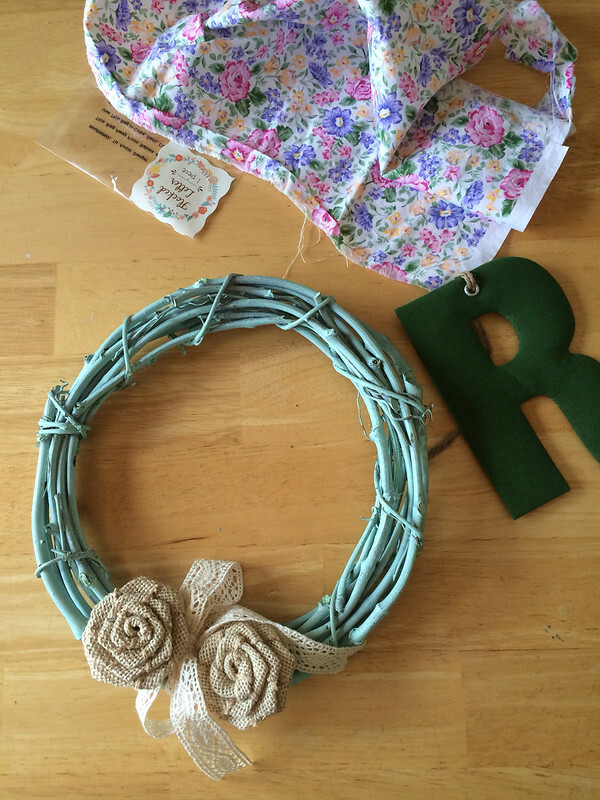 I tied a tighter knot in the twine and cut off the excess so it would hang at the right height inside the wreath. I hung that from a small nail in the wall, and then stuck the wreath on top. And that's it! 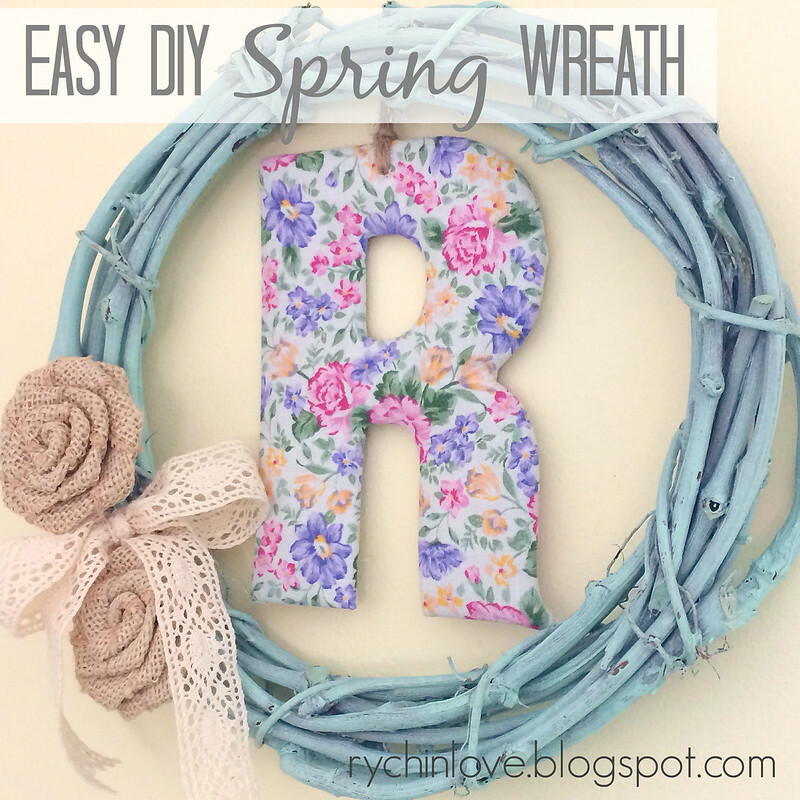 So simple, so cute, so springy. SO loving it!